Buscot Park - Faringdon Community Website. Set in parkland within an agricultural estate [fruit and plants on sale in season], the house was probably built about 1770, with minor additions and alterations. 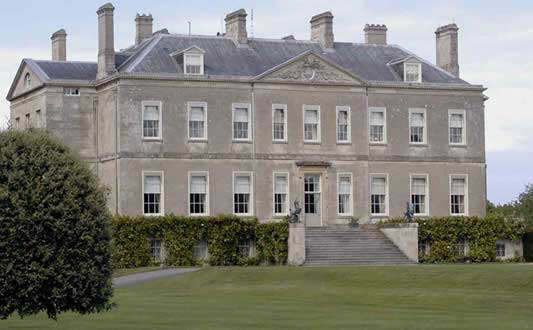 The entrance is by broad steps up to the pedimented south front of nine bays. To the right (east) a c19 extension was replaced between the wars by a secluded swimming pool, its further end backed by a Tuscan facade, where a central tunnel vault separates a squash court from a charming small theatre[offering occasional public performances]. The walls are notable for a series of paintings with political (socialist) and domestic themes. The entrance hall and two flanking saloons contain many and varied works of art, in all a miniature private museum. The large paintings are outstanding - the Sleeping Beauty cycle, by Sir Edward Burne-Jones, fitted in his splendid gilt frames round three walls. The neo-classical decor is generally "Adamish", with a few more modern additions. © Gerald Taylor 200 National Trust Guide. Pevsner Berkshire p 108. Gavin Henderson, 2nd Baron Faringdon, (1902-1977) , A noted pacifist, he served in the London and Faringdon Fire Brigades during World War II. Local fireman called him 'Lordy'. In 1936 frescoes were painted on the ceiling and walls of the entrance to the Little Theatre. You can see some of the paintings here and the stories behind them, written by Roger Vlitos in 2014.